Late spring and early summer is a great time to have a rental on the market. Many job related moves occur during this time of year and often families are looking to be settled before a new school year begins in the fall. As a result, marketing times are often shortest during this period and landlords tend to have the most influence in getting top rents. If you are contemplating putting a rental on the market in 2015, we would advise trying to make it rent ready by September. The accompanying days on market illustrates this strong seasonality. Using the multiple listing service as a proxy for market wide themes and in terms of supply and demand, most of 2014 saw more leases signed than new listings entering the market. Currently listing activity has expanded into 2015, however active for-lease inventory is near the lowest it’s been since we began tracking these levels in 2012. Interestingly, single family rental pricing has been climbing gradually market wide. Year-over-year increases in the average rent per-square foot has recently been nearly four percent, which is pretty substantial for a market that is typically flat. There may be some quality differences associated with these rents however. Many in the last wave of investors, which included institutional owners either organized as REITs or backed by Private Equity shops, have been doing pretty solid rehabs on their properties as part of a branding effort and are potentially helping to drive up rent prices through perceived value. Additionally, the labor market has been improving in Las Vegas and household formation appears to be growing again, driving some demand for rental housing. Our own rental pool is confirming this trend too and owners have more pricing power than they have had for a long time. Finally, while Census housing data presents a lot of challenges as a general proxy the Census Housing Vacancy and Home ownership gives us a picture of what rental vacancies are looking like. 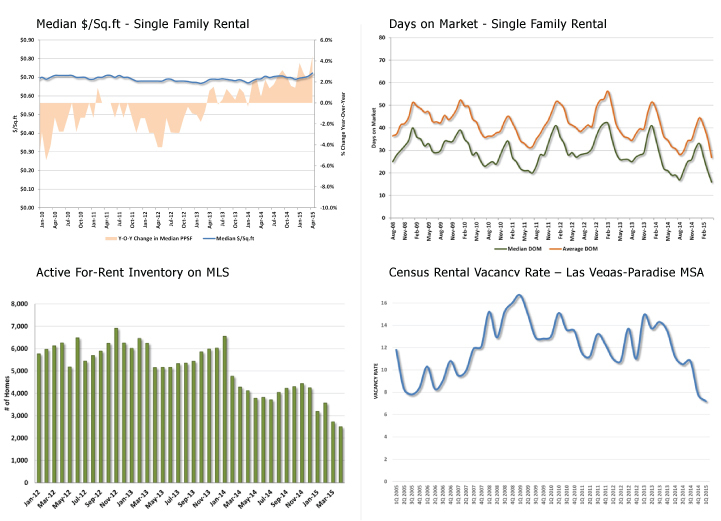 In Las Vegas we have seen a major turnaround and the lowest rental vacancy rate observed since 2005. Since the Census has had some methodological changes, we aren’t focusing too much on any specific number, however the trend suggest significant movement towards lower vacancy rates. Source: Mlxchange, Coldwell Banker Premier Realty. *Bank owned listings not under contract. Note: Averages tend to be greatly influenced by outliers. Condominiums/townhomes exclude high-rises. The information and opinions in this report are believed to be reliable and has been obtained from sources believed to be reliable. Coldwell Banker Premier Realty makes no representation as to the accuracy or completeness of such information. The opinions expressed in the report constitute the judgment of the authors only and may not reflect the opinion of Coldwell Banker Premier Realty. This report is provided for informational purposes only and does not constitute investment advice. This report may not be circulated or copied without our prior written consent.